Utilizing the latest rehabilitation techniques, our rehab team focuses on restoring function and allowing patients with neck and back pain to return to a normal active lifestyle. Researching the most advanced rehabilitation techniques developed under the leadership of world-renowned orthopedic surgeon, Dr. James Andrews, Dr. William J. Schwarz has developed the most comprehensive rehabilitation protocols for the most complex elbow injuries. 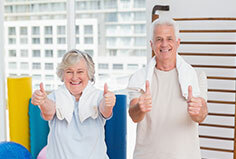 Our personalized one-on-one treatment of geriatric and neurological conditions provides our patients with the ability to perform daily living activities and regain functionality by enhancing strength, flexibility and endurance.